Effect of specific storage conditions on the viability of acteriophages SaPL, IttPL, JIIP, RLP and RSP, after one year storage. Phage titre before and after storage at -80°C (A), at -20°C (B), at 4°C (C), at 25°C (D) and at 37°C (E). 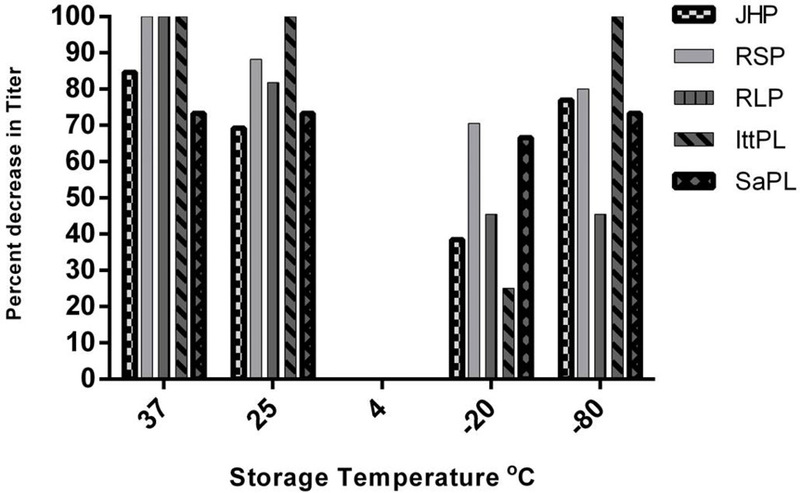 Decrease (%) in the titers of bacteriophages JHP, RSP, RLP, IttPL and SaPL after one year of storage at different temperatures.